Stop the presses! 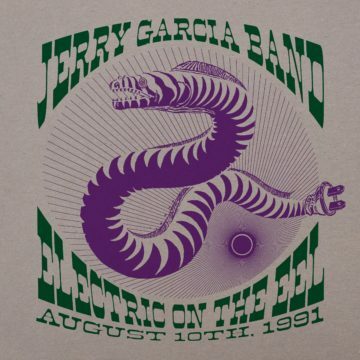 Well not literally… We’ve heard your requests for live Jerry Garcia Band vinyl and are thrilled to announce Electric on the Eel: August 10th, 1991 will be released as a 4-LP 180gram set in celebration of Record Store Day on April 13th. The complete two-set performance from French’s Camp on the Eel River in Piercy, CA is presented on five sides, with side H featuring an etching sourced from Thos Chapman’s original show poster. The set, which holds the distinction as the first-ever live Jerry Garcia Band vinyl release, will be produced in a limited edition of 2,000 by Furnace Record Pressing in Virginia. The August 10th, 1991 performance at Eel River stands out as one of the latter-era Jerry Garcia Band’s finest. The setlist is as unique as the venue — and uncharacteristically dotted with rarities including The Band’s “Twilight”, Johnny Mercer & Hoagy Carmichael’s “Lazy Bones”, and Eric Clapton’s soul-stirring “See What Love Can Do.” Buoyant versions of “Lay Down Sally”, and an epic, set-closing “Everybody Needs Somebody To Love” close the band’s run at Eel River on an especially high note.